So everyone in Korea these days is talking about one TV celebrity cook named Mr. Baek. 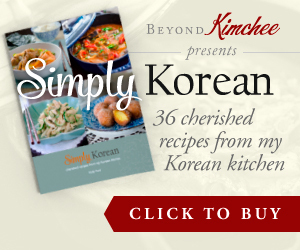 He has his own cook show where he introduces easy Korean recipes that can imitate the taste of restaurant style Korean food at home. Some people adores his recipe, and some don’t. I only watched a few episodes of his shows, and found a few recipes interesting. One of them is this multi-purpose soy sauce. It only has 3 ingredients and needs just 5 minutes of cook time. You can use this sauce into pretty much anything that requires soy sauce with a hint of sweetness. 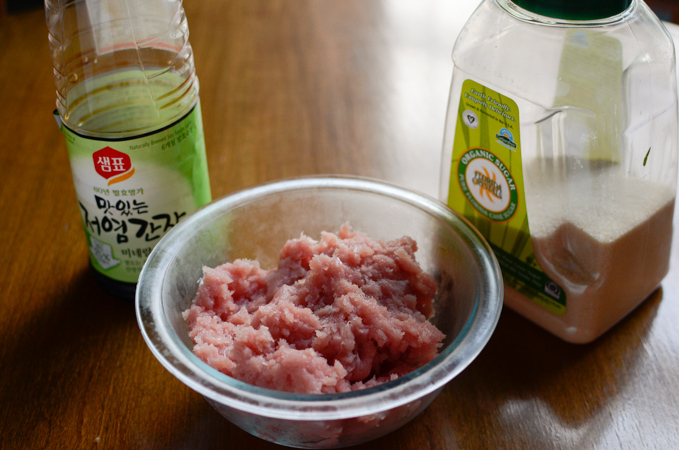 Soy sauce ( I recommend to use low-sodium soy sauce), ground pork (or beef if you can’t have pork), and sugar. The golden ratio of these 3 ingredients is 6:3:1. However, I don’t think it has to be the exact amount. You can add more meat, and more or less sugar depends on your preference. I combined 1 cup of soy sauce, 1/2 cup of ground beef, and 2-1/2 tablespoon of sugar in a small pot. Bring them to a gentle boil first, then simmer over low heat for 4-5 minutes. That’s all you need to do for cooking. Super easy, isn’t it? You can store this sauce in a fridge for quite a long time (about a few weeks?). The amount I made was perfect to use for 2 weeks in various dishes. 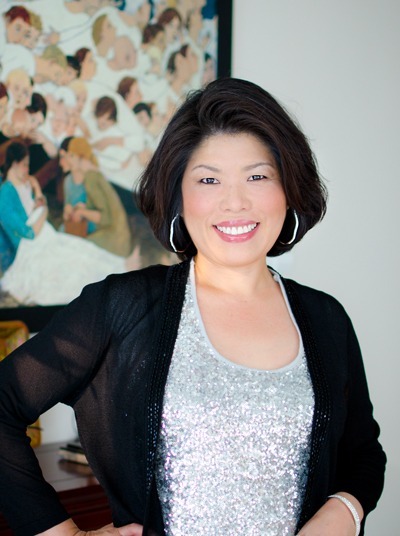 So…, what dishes have I made with this easy multi-purpose soy sauce? Here is the quick braised tofu. A rice stealer, I would say. Quite yummy! 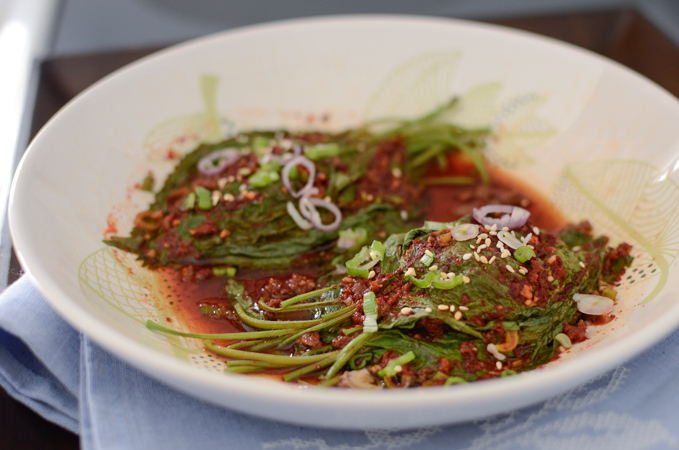 Steamed Perilla leaves, one of the popular summer side dishes in Korea~! 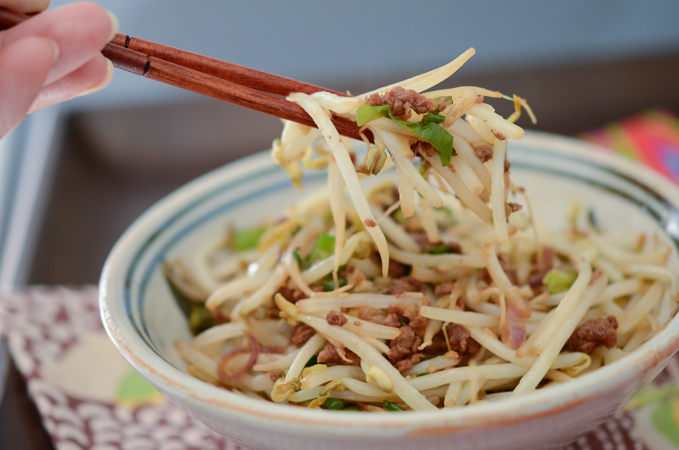 and my favorite…, the stir-fried Mung bean sprouts! So yummy! Easy dish takes only about 5-10 minutes to complete. Don’t worry, I will share these simple recipes in my next posts. 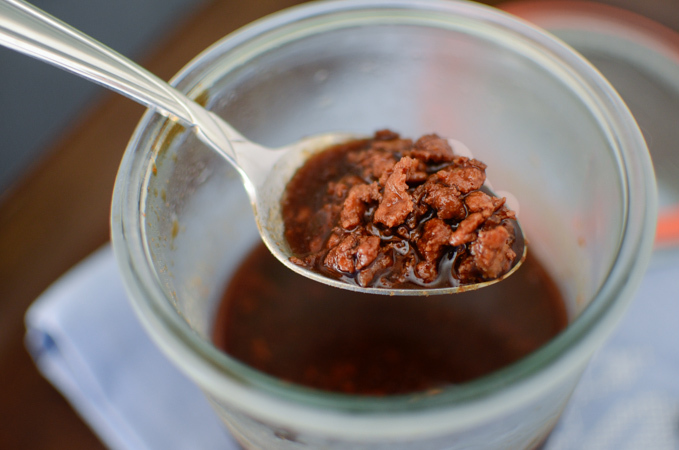 There are many more dishes you can make with this multi-purpose soy sauce. I think Mr. Baek is brilliant to come up with this sauce recipe. I love it! I hope you guys will give this a shot. You will like it as well. Oh, I better come up with my own version of multi-purpose soy sauce. I am a little motivated. 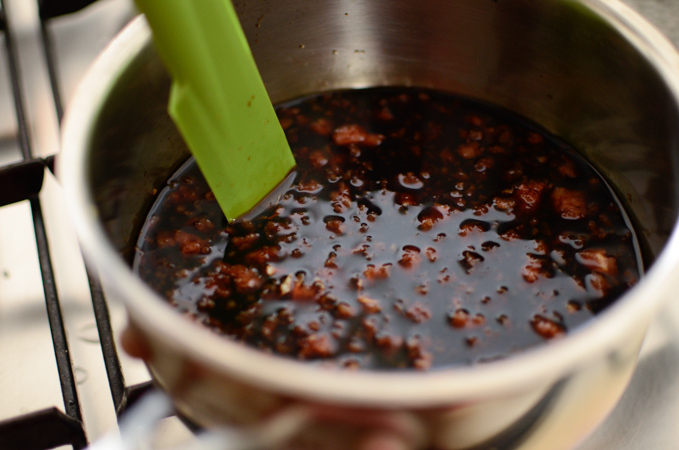 Use this handy multi-purpose sauce to create many delicious dishes in no time. 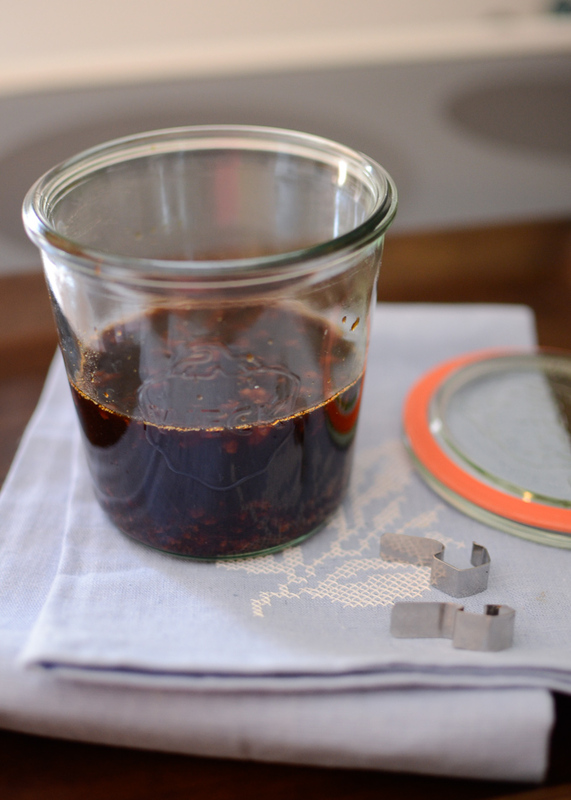 Combine soy sauce, pork, and sugar in a small sauce pan. 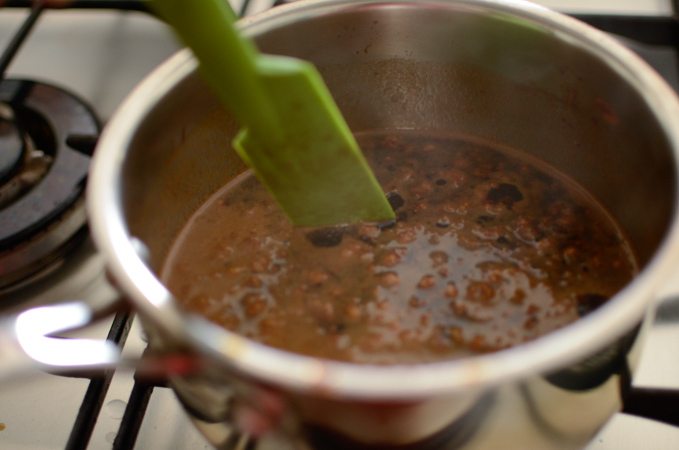 Bring them to a gentle boil and simmer for 4-5 minutes over low heat stirring occasionally. Let the sauce cool and store in the fridge for a few weeks. 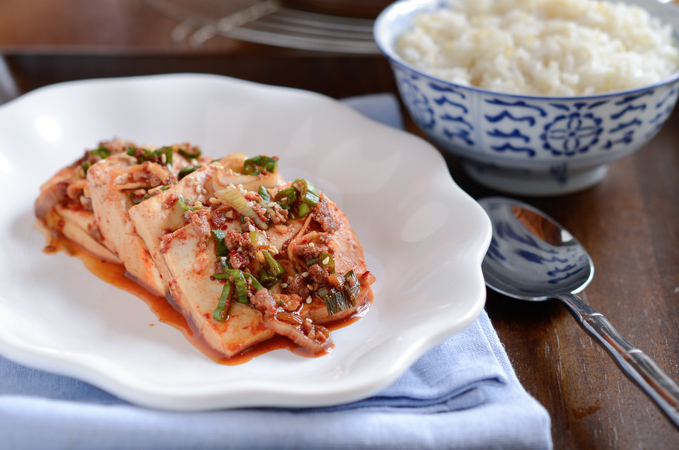 This recipe is adapted from a Korean cook show called "home-cooked meal by Mr. Baek". Does it make any difference to use Korean, Chinese and Japanese brand soy sauce? Thanks. I would recommend Korean or Japanese soy sauce. This sounds great! Perfect as a marinade or any number of uses! This Mr. Baek sounds very interesting! I wish I knew Korean to watch these programs, but I hope you will present us more of his recipes because this one looks really amazing. I love pork, I love soy sauce (I also use low-sodium... we love it too much to use in tiny amounts ;-) so it's safer this way) and from what I see I'll fall in love with this versatile sauce! Thank you so much for sharing (it's funny but I have recently posted a recipe I found on a Japanese tv program! ).